I was searching around on Amazon, spending way too much money for a teacher in summer, and came across a super cool product that lit a spark! 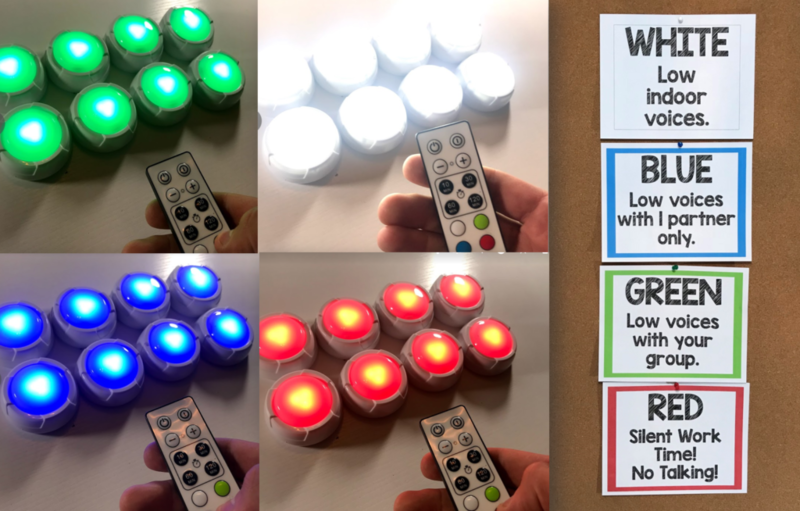 Classroom Management, color-changing, remote-control puck lights! That’s right PUCK LIGHTS! Check them out here! These lights are awesome and will help out bunches with classroom management. So, here is the low-down on how I am going to use the lights. I am going to place one light puck at each of the groups in my classroom. If you don’t have tables in your class, you could simply place the lights on your board or around your classroom. They come with the batteries and a circular 3M strip, which will keep them where you want! The remote that comes with the lights reaches up to 13 feet, so they will pretty much control the lights from my desk or the front board in my classroom. I am using a color coding system to let students know what the color means when it is on. Blue- Low talking with 1 partner. Green- Low talking with your group. I made a set of posters that you can post in your classroom to let kids know what each color means. You can snag them for free here! One set of posters is editable (PowerPoint file) and the other is a PDF (non-editable). There is also information included on how to download the font I use if you are using the editable file. The possibilities for these puck lights are endless, but this is how I am choosing to use this fun Amazon find! You can get the lights here! *How to help end LOSING pencils! *How to keep headphones organized! *How to Make GEODOUGH to teach Geography!